Definition at line 1042 of file lscript_tree.h. Definition at line 1045 of file lscript_tree.h. Definition at line 1050 of file lscript_tree.h. 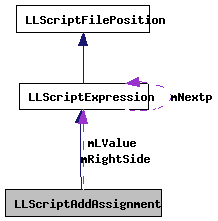 Definition at line 4494 of file lscript_tree.cpp. 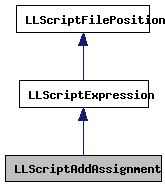 Definition at line 4432 of file lscript_tree.cpp. References LLScriptByteCodeChunk::addByte(), gErrorToText, LLScriptGenerateErrorText::getErrors(), LLScriptExpression::gonext(), legal_binary_expression(), LOPC_ADD, LSCP_EMIT_ASSEMBLY, LSCP_EMIT_CIL_ASSEMBLY, LSCP_PRETTY_PRINT, LSCP_TO_STACK, LSCP_TYPE, LSCRIPTOpCodes, LSCRIPTTypeNames, LSERROR_TYPE_MISMATCH, LLScriptExpression::mLeftType, mLValue, LLScriptExpression::mReturnType, mRightSide, LLScriptExpression::mRightType, LLScriptExpression::mType, NULL, operation2stack(), print_asignment(), print_cil_add(), print_cil_asignment(), print_cil_load_address(), print_cil_numeric_cast(), LLScriptExpression::recurse(), store2stack(), and LLScriptGenerateErrorText::writeError(). Definition at line 1057 of file lscript_tree.h. Definition at line 1058 of file lscript_tree.h.